Authentic simplicity. 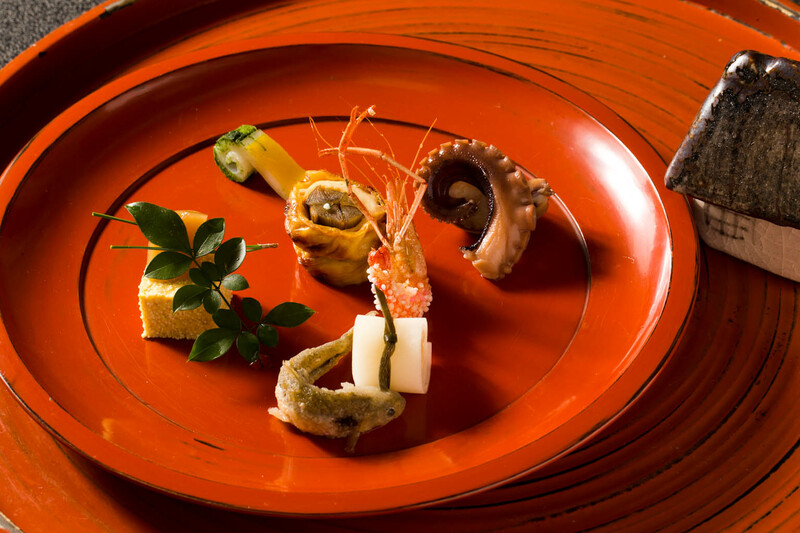 This earnest chef of traditional Kyoto kaiseki cuisine knows that true goodness comes from within. 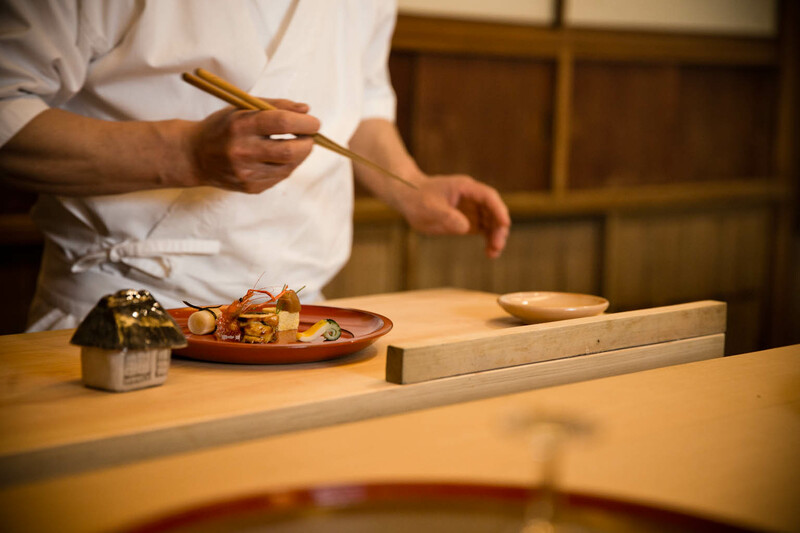 At Oryori Hayashi, from the ingredients to tableware and the chef himself, every aspect of the dining experience is genuine and real, and discerning customers can tell the difference. 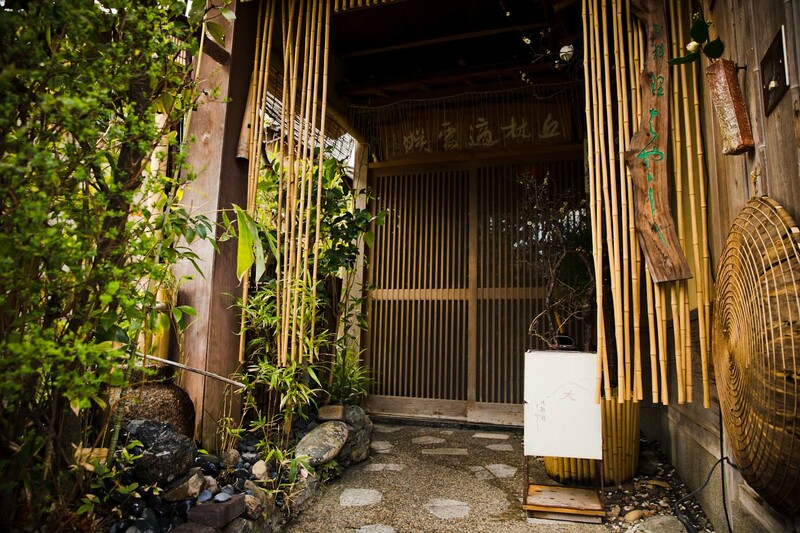 A visit to Hayashi feels like an invitation into a traditional Kyoto home. Carved into Daimonji mountain to Kyoto’s northeast is the character for “large”, burned by fires each year to mark the end of the Obon Festival. This landmark is the symbol on the lantern outside Oryori Hayashi, just a ten-minute drive from Gion, near the Imperial Palace and the Kamo River. In the front garden, the natural color variations of bamboo and greenery contrast with smooth black rocks, as the soundtrack of trickling water helps you focus on the moment. Soft light reflects off the stone pathway guiding you to the slightly rickety wooden sliding door and the warm welcome from the hostess. Removing your shoes, you make your way to either the seven-seat counter or one of two private rooms upstairs. Ease down into the sunken counter using the wooden arm rest. In the colder months, heating from below the bamboo floor warms your feet, emphasizing that for Chef Hayashi the diner’s comfort is paramount. While it is more typical to value function over form in interior design, Hayashi has purposely focused on creating a space that exudes comfort. He designed the interior by himself guided by the concept of futility, wishing it to feel free-flowing and spacious. A place where customers come to relax should not be designed with every corner in use – it should allow for comfort and flexibility. From behind the clean counter, the chef appears with his serious, focused expression bringing a slight air of tension to the room. Your heart beats with expectation for the experience about to begin. Loved by 3 starred chefs. 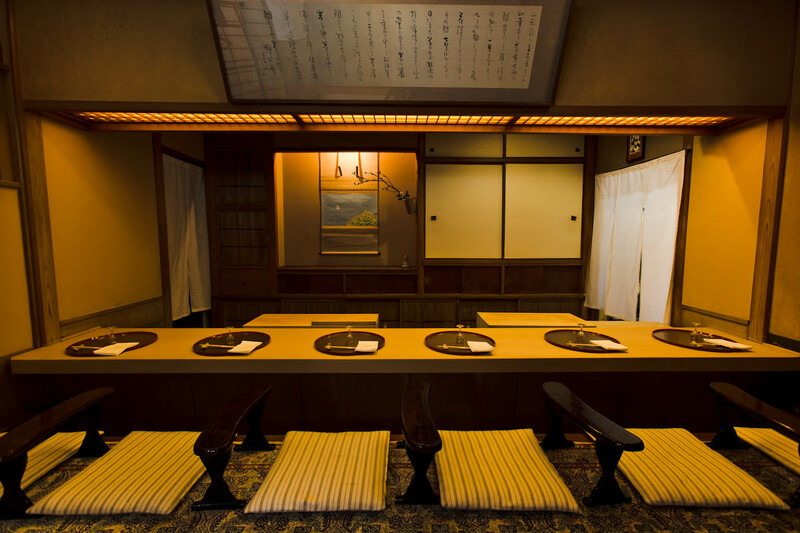 Oryori Hayashi cuisine is classic Kyoto style. Each dish is as simple as it can possibly be, focused purely on drawing out the flavors of the individual ingredients that emerge each season. Hayashi takes inspiration from within and from his studies of tea ceremony, ikebana flower arrangement and calligraphy, all of which give him deeper insight into traditional Japanese culture, which is in turn reflected in his beautiful cuisine. The meal begins with a beautifully round lily bulb manju steamed bun topped with freshly grated wasabi. Tucked inside the warm dough is duck meat combined with yuba, the thin and smooth yet slightly chewy layer that develops on the surface of gently boiled soy milk. 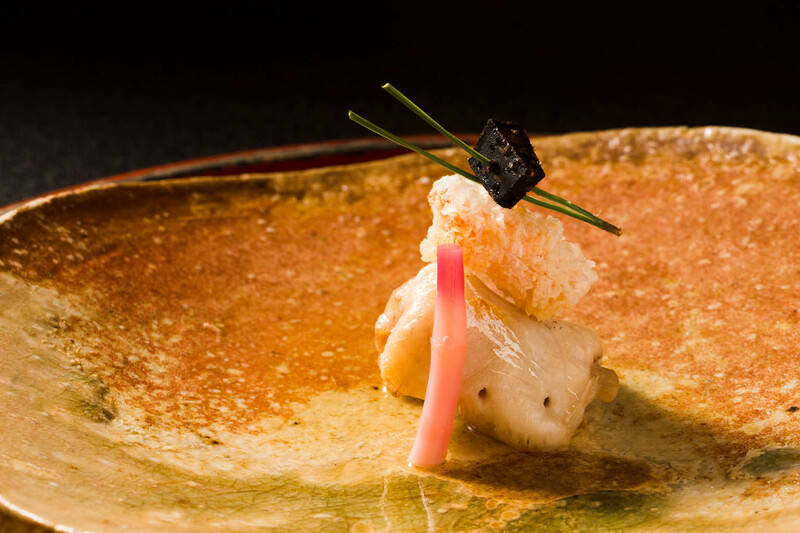 Enjoyed with a luxuriously velvety dashi, each bite is tender and succulent. The chef busies himself with the hassun course, which sets the seasonal theme for the meal. 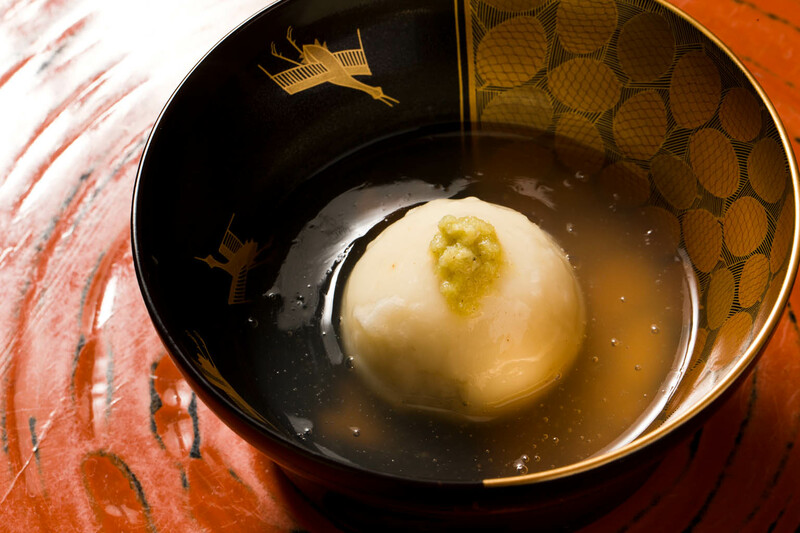 The round lacquer plate starts with a small square of sea bream eggs and yuba-rolled burdock root simmered in sweet soy flavors. Little morsels of various shapes and colors are added and layered, developing into an elaborate plate of seasonal ingredients, colorful and eye-catching as an artist’s palette. Rolled daikon, simmered ginger, escabeche of moroko minnow fish, and baby octopus. A colorful yellow and green spiral of squid, dusted with seaweed powder, is skillfully created to resemble warabi fiddleheads, loved by the Japanese for their suggestion of spring. The diner’s mouth waters with every addition; the chef pauses only to sharpen his knives. At last, the gift is presented to you, accompanied by a quaint pottery house filled with miso-marinated butterbur shoots, an early spring delicacy. Dedication to only using the best ingredients means the clientele is highly discerning. You cannot fake delicious food with such simple preparation. As with the plump and juicy simmered tilefish flavored delicately with dashi, the ingredients and flavors are laid bare. This is what draws customers as well as many fellow chefs – the simplicity and authenticity of the flavors over a full kaiseki course. Chef Hayashi does not talk much or explain each dish as he presents it. When he dines, he prefers the personal experience of each bite. In the same way, he wants customers to enjoy their own experience, guided by their imagination as they savor the food he has created. He may appear stern, but as you ask about the ingredients and seek to understand more, he opens up and you realize just how friendly and passionate he is. The fastidiousness about flavor does not stop with the food. The alcohol offering at Hayashi is equally selective and, of course, delicious. An original variety called Hayashi no Izumi (Hayashi’s Fountain) is the only sake available. 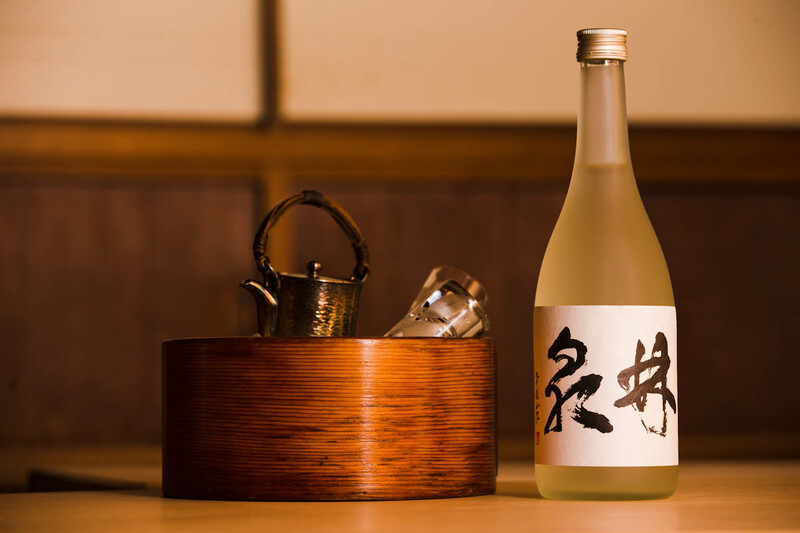 Or you can enjoy pure barley shochu made by Kuroki Honten in Miyazaki Prefecture, including Nakanaka – unaged with intense earthy aromas – or Hyakunen no Kodoku (One Hundred Years of Solitude), a generous, mellow amber liquid that results from a long ageing process in oak barrels. And lastly, whiskey. Three choices. Pure, simple and delicious. Hayashi is extremely particular about the ingredients he uses. He relies on specific suppliers for every item from yuzu citrus to matsutake mushrooms and develops personal relationships with them. He shows how much he values them by frequently inviting them to dine at his restaurant. Freshwater fish and seafood is procured through a fishmonger Hayashi met early in his chef career and has been working with for more than three decades. He doesn’t see himself as a customer of the suppliers; rather, he believes strongly that the customer experience of his food is a 50:50 collaboration with his suppliers. Always aware of his partners, he builds relationships with consideration for how everyone can benefit. Originally from Minakami, Gunma, a famous hot spring area north of Tokyo, Wataru Hayashi neither comes from a restaurant family nor did he set out to become a chef. The idea came to him when his plans for university fell through, and he figured that if you want to be a chef, there is no other place but Kyoto. At the age of 18 he joined Okamoto, known for Kyoto cuisine, and subsequently worked at three other restaurants before becoming head chef at Uzuki at the incredibly young age of 25. He credits his speedy rise to a voracious appetite for books of all kinds on Japanese history, culture, and many other themes that together form the foundation of Japanese cuisine and guide Hayashi in his creations. When he branched off on his own seven years later, he started a larger restaurant more than 30 minutes by taxi from Kyoto station. The economy was booming so despite the rather odd location, Hayashi’s restaurant was a big success, but after five years, he longed to be more centrally located. He purchased land and built a new restaurant. That was the beginning of Oryori Hayashi as we know it today. Now 61 years old, Hayashi is very proud to be at the helm of a restaurant that has been pleasing customers for thirty years. His sincerity has won the hearts of many and he wants to share that satisfaction by raising skilled apprentices to follow in his footsteps. Some of his staff have been with him for more than ten years, and it would be a great loss to no longer have them in the kitchen by his side. But he really wants to encourage them to persevere and take that step. There is enormous joy in seeing an apprentice go out on their own, telling customers they came from Hayashi. He remembers very well how hard it was when he started his own restaurant, and knows that he was supported by many on that journey, thus it is time to give back to the next generation of great Japanese chefs. The exquisite tableware collection is so extensive you could be mistaken for thinking this is a museum. The antique and modern ceramics are complemented by antique Italian glassware and decorated lacquerware, and when a new season begins, the whole collection is switched. 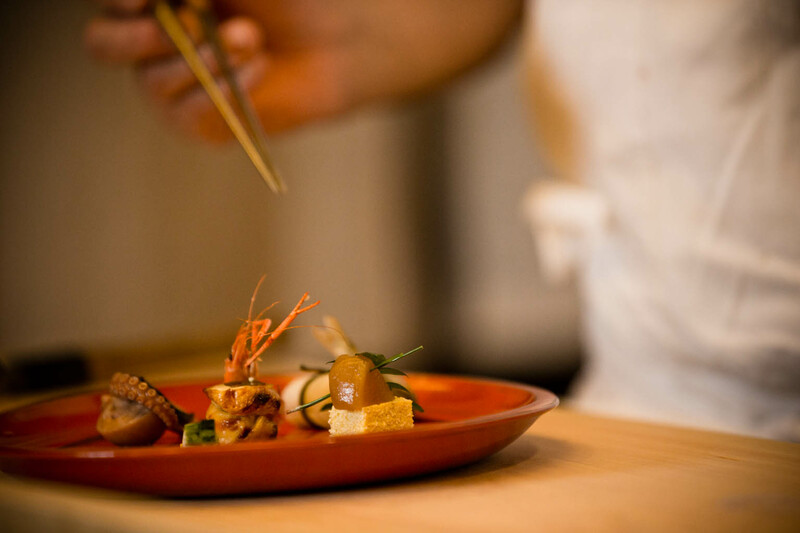 With Hayashi’s skillful dish selections and attractive food creations, each course that arrives is a seamless work of art. Astutely purchasing items from restaurants that go out of business, Hayashi has gathered pieces made by countless prominent artists. They include Kakiemon glazed porcelain with detailed decoration in soft red, yellow, blue and turquoise, in the characteristic style of this Arita ware kiln that has been producing ceramics since the 1600s. 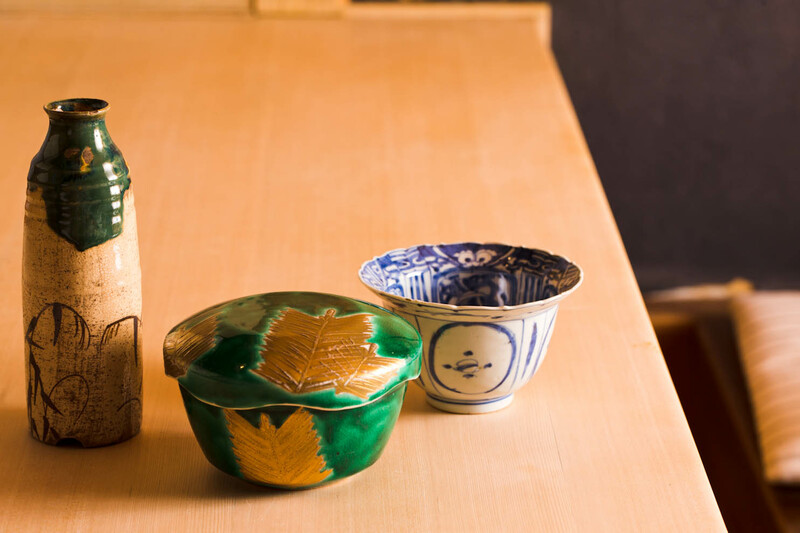 The brilliant greens of Eiraku Kutani ware from present-day Ishikawa Prefecture also feature, as in a lidded green dish adorned with golden pine needles. The bold colors were thought to have been preferred for the joy they bring amidst the harsh grey winters of the region. Striking white pieces cloaked in crystal blue glazing, either sharply angular and luxuriously smooth, are the works of Tsubasa Kato, a contemporary artist born and raised in the ceramic traditions of Mino in Gifu Prefecture. 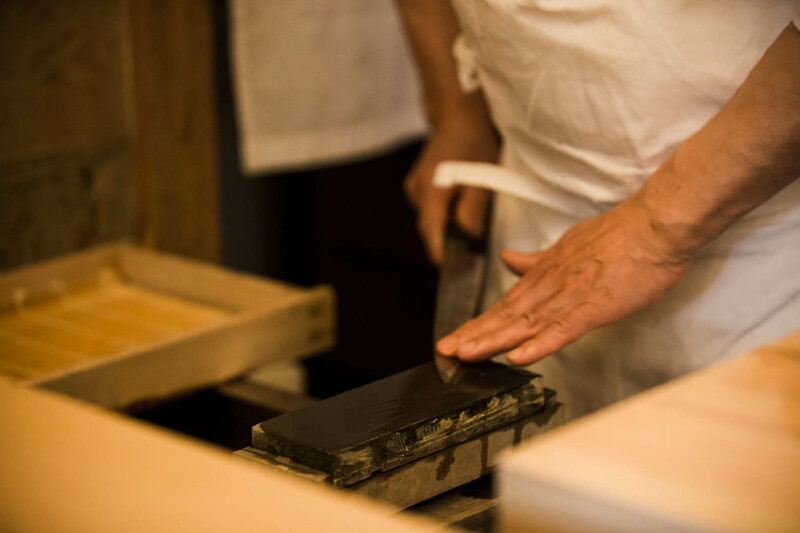 In the same way that the suppliers of the food ingredients are highly valued, several of the ceramic artists are close associates and often come to dine at Hayashi. He feels very strongly that the dining experience he presents is a collaboration between all these players.